Amazon Extends Same-Day Delivery To Previously Excluded Boston Area : The Two-Way Mayor Marty Walsh was among those who called out the online retailer for not offering the service in a centrally located, predominantly black community. Bags are loaded for delivery at Amazon's urban fulfillment facility in New York last year. 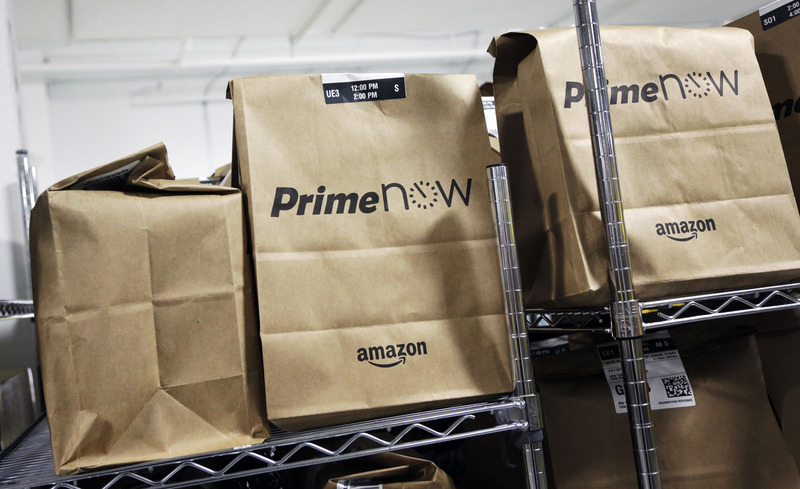 In some areas, Amazon Prime subscribers can get free same-day delivery. This post was updated at 7:45 p.m. ET. A central neighborhood in Boston had been left out of Amazon's plans for free same-day delivery in the city. The company said on Tuesday that will change. A Bloomberg analysis last week showed that the predominantly black Roxbury community did not have access to the Amazon Prime service, which is offered to all adjacent neighborhoods. After looking at nationwide data, Bloomberg called the disparity in Boston "the most striking." Boston Mayor Marty Walsh, who had criticized the inconsistency, tweeted on Tuesday that Amazon had notified him of the change. "I thank them for this decision," he wrote.
.@amazon informed me today that they will now be offering same day service to every neighborhood in Boston. I thank them for this decision. In a statement to The Boston Globe, the mayor's office said the city's chief of economic development and chief of policy "had been in conversations with Amazon before the mayor's call." Amazon says it is "actively working with our local carrier to enable service to the Roxbury neighborhood in the coming weeks." The statement from Scott Stanzel, director Amazon's operations communications, adds that the company is not done expanding same-day delivery nationwide and that all Prime members already have free two-day and one-day shipping options. In its report last week, Bloomberg noted that there was "no evidence that Amazon makes decisions on where to deliver based on race." "Demographics play no role in it. Zero," Amazon's vice president of global communications, Craig Berman, told the news agency. Berman said that those decisions were instead based on where existing Amazon Prime customers live. The Boston Globe's own analysis indicated that "the three ZIP codes excluded from same-day delivery by Amazon are among the poorest in Boston." The service is available only to monthly subscribers of Amazon Prime. Those customers can get free same-day delivery on orders of at least $35.